The add-on only sells the content field. This means that the posts title, excerpt, featured image, comments or any other custom field / feature added to the post is not touched by the add-on. This also means that if the “content” is stored or managed outside the content field, the add-on will not be able to sell it. The add-on supports sales of any publicly visible post types. When you setup the add-on you get to select which post type you want to sell. You can sell posts, pages or custom post types. You can sell access to media files if they are presented on your website like all other content. Media files that are embedded in contents however can not be sold individually. Instead you would need to sell the content they are embedded in! Remember that the content author and administrators / editors will always see the original content! As of version 1.7.6 the settings have been re-styled to work better on mobile devices. First, we need to decide which post types that we want to sell access to. 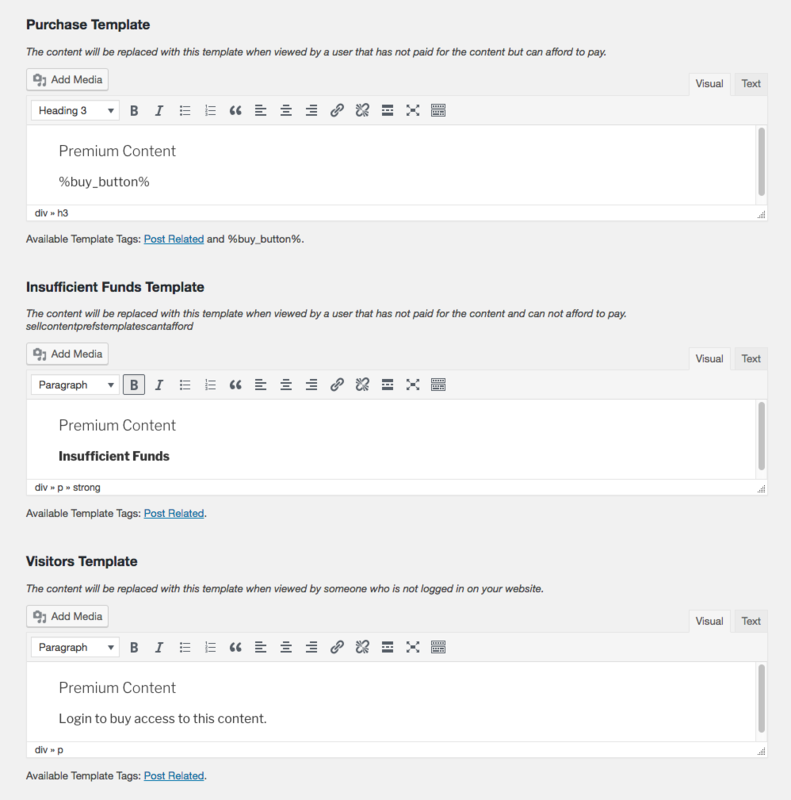 You can select to sell specific posts or filter based on taxonomies. All "post type" All items of this post type will be set for sale. "post type" I manually select Only items you manually select to set for sale are sold. When editing the post type you will see the "Sell This" metabox where you can enable sales of each particular item. All "post type" except All items of this post type is set for sale with the exception of a list of post IDs that you provide. Only "post type" Only items listed by ID are set for sale. Only "post type" in Category Only items in one or multiple categories are set for sale. Only "post type" not in Category Only items that are not in a particular category are set for sale. Only "post type" with Tags Only items with a particular set of tags are set for sale. Only "post type" without Tags Only items that do not have one of the tags you provide are set for sale. Only "post type" with Format Only items with a particular format are set for sale. Only "post type" without Format Only items that do not have a particular format is set for sale. You can nominate multiple taxonomies / formats by separating them with commas. Depending on which post type you select, you can select taxonomies that are connected with that post type. “Categories” and “Tags” are by default available for “Posts” only. Once we have selected which posts we want to sell, we need to select what point type(s) we want to accept as payment. If you only have one point type, you will of course only be able to sell using that particular point type. If you have multiple point types however you can select which ones you want to use and setup the price, expiration and profit share for each point type individually. Each point type also comes with a dedicated template for button labels and payment log entries. For designers, there is also the option to customize the button CSS classes for each point type if needed. You must select “Enabled” as status for all point types you want to use. The status field was added to allow you to quickly disable a particular point type without disrupting sales of other point types you might be using. Otherwise if you only have one point type installed and select “Disabled” as status for your point type, you will disable all sales. This means, that users will see the “Insufficient Funds” template and will not be able to purchase any content while the content will still be hidden from them (unless they have paid of course). Be careful selecting to set all Pages for sale by default! Pages are used by a lot of plugins, especially profile or store plugins. By enabling sale of all Pages by default, you can block access to these plugins! This template is shown to users that have not yet purchased the content but can afford to do so. This template is shown to visitors of your website who are not logged in. This template is shown to users that can not afford to pay for the content. The Sell Content add-on supports purchase expirations, which means that once a certain number of hours have passed, the sale is voided and the user must pay again to access the content. Expirations do not mean the user receives their money back for the sale! By default the Sell Content add-on will just charge the user for the content and the points charged are simply deleted from their account. You can however enable profit sharing, where a percentage of the sale is transferred to the content author. You can use any percentage value, positive or negative and even payout over 100% if you prefer. By default, the add-on sells content to the entire content field of your post type but you can change this and sell only parts of the content. To do this, we will need to somehow “mark” which part of the content is set for sale. This is where the mycred_sell_this shortcode comes in handy! Weap this shortcode around the section of content you want to sell access to, and the rest of the content will be visible to the user. Note that while you can use this shortcode multiple times in the content field, it is NOT supported. The add-on will sell access to just one part of the content and if you try and sell access to multiple parts, all parts will become available when purchased by the user. You should only use the shortcode once per content! Note that as of version 1.7, the mycred_sell_this_ajax shortcode has been removed!